The Warlords of Twisted Cosmic Horror have returned! 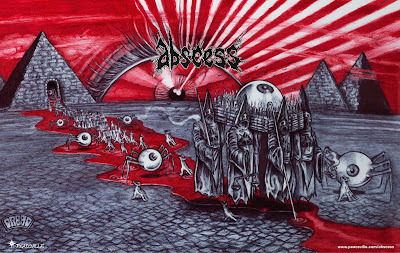 ABSCESS have vomited forth their latest masterpiece of viral Death Metal and I can now unveil this new ballpoint abomination! I'm really excited about how this one turned out. Slated for a March 2010 release and heralded as the most epic Abscess recording to date, Dawn Of Inhumanity features guest vocals by Fenriz and Nocturno Culto and is presented as a special digipack book with interior art by Chris Reifert! Available NOW for pre-order at Peaceville/Tyrant Syndicate. Prepare for total sickodelic warfare from beyond the grave! 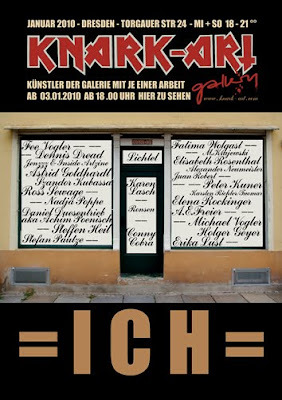 Art Show in Dresden This Month! I have prints in this group exhibition at KNARK ART this month! Best wishes to you all in the new decade!